For many years (today's date is 11-14-18) I’ve been asked to make a good full power load for the 375 Winchester. Until now, brass was very hard to come by, but Starline is now making high quality 375 Winchester brass, so we are in. The bullet we’ve chosen is the Barnes Original 255 grain. We use this same bullet in our 38-55 ammo, but we use it sized to .377 inch diameter in the 38-55, instead of the .375 inch diameter bullet we are using in this 375 Winchester load. This is a tough bullet that will expand but still penetrate deeply enough for use on large critters like elk or interior grizzly. In my only remaining 375 Winchester carbine, (I long ago sold the others because I was using our 38-55 ammo in my 38-55’s instead, which gives the very same ballistics as this new 375 Winchester load) this load averaged 1,994 fps, from my 20-inch barrel. My carbine is a Winchester 94 “Big Bore," see image below. You can fire our 38-55 ammo in any/all 375 Winchester firearms or you can now fire this new 375 Winchester load in your 375 Winchester chambered firearms. For more information on this subject, please read this…… Using Our 38-55 Ammo in 375 Winchester Chambered Rifles -- You should; however, NEVER fire our 375 Winchester ammo in any 38-55 chambered firearm!!! 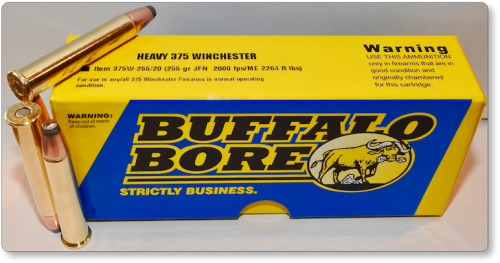 This new 375 Winchester load operates well below the industry spec. of 52,000 CUP and as mentioned is safe to use in any/all 375 Winchester firearms in normal operating condition. This load mimics the original 250gr. 375 Winchester load at around 1950 fps, but we are using what I think is a better bullet. Enjoy this new load and God bless.